Specifications and material information about this pen are listed below. I had a little trouble coming up with a name for this one using my standard naming scheme (names from the worlds tallest mountain peaks). 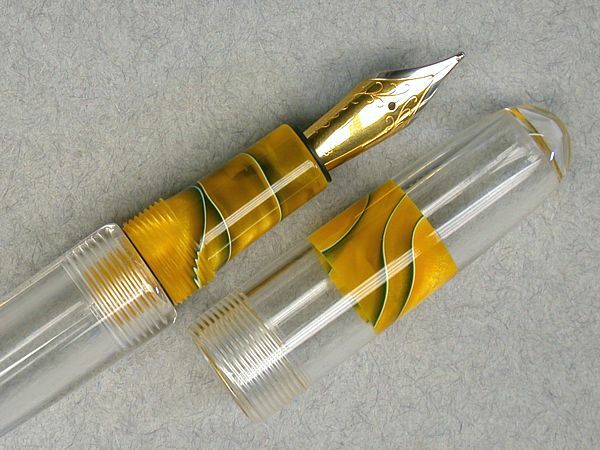 I wanted it to reflect the style of the pen, but also wanted it short to reflect the pens size. Looking through the list of (mountain) names, there just wasn't anything that fit. So I decided I had to come up with something different, but a name that would still fit the pen and would be easily recognizable. After carrying it around in my pocket for a few days, it finally hit me, and I had the perfect name-- The "PFP" (short for "Pocket Fountain Pen"). OK, it may sound a little lame at first, and not very imaginative, but it fits perfectly and after a while I thought it sounded kind of catchy. Originally, this pen was just to be an exercise to see if I could make such a small pen, but once I showed it around, it was so well received (and desired) that I decided to add it to my line-up permanently. And as you can see from all the colors, it has since become one of my most popular pens. Design Idea... OK, I'll admit, it's not a totally new design, but rather my take on a the old Stipula Passaporto. A friend sent me a Passaporto, and I fell in love with it! Now that I'm in my retirement years (retired from my OLD 9-5 job that is), I'm not much of a suit and tie guy anymore (only an occasional sport coat), so I need a fountain pen that travels well with casual clothes. Clip pens are OK if I have a shirt pocket or I'm wearing a sport coat, but I don't always wear those. 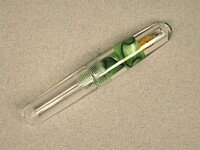 I use to carry one of the original "Bullet" pens (a stubby football shaped ballpoint). But being into fountain pens, I wanted a portable fountain pen that I could easily carry AND use. So started looking around to see what was out there, and found their weren't many. I mentioned it to a friend and he told me about his Passaporto. It just so happened that he didn't use it, so he offered it to me. Once I started using it, it didn't take long to fall in love with it. Besides being handy, it's also a great conversation piece. So whenever I pull it out of my pocket, it stirs a conversation about pens and gives me a prefect segway into a sales pitch! But what isn't good, (and it always comes up), is when people inquire about the Passaporto, and ultimately ask if I made it. Of course although I hated to say it, I had to say no. Not a good answer from a custom pen maker. So after having to say that too many times, I decided I needed to come up with my own pocket fountain pen. Something that I felt was a more suitable calling card. So this pen is my take on the Passaporto. NOTE: Stipula has since changed their design and eliminated the posting threads on the barrel. The overall target specs for the pen are: 3.75" capped, 5.25" posted (with #5 nib). Maximum diameter is about .62". 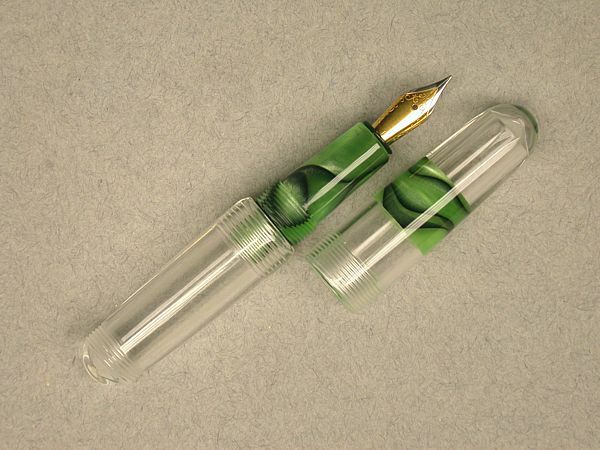 Because it's a hand-made pen, the specs can vary slightly based on the desired shape and hardware used. 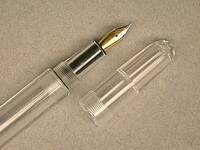 The standard PFP uses a #5 nib, but can be ordered with the larger #6 nib. However it will require a slightly longer cap. The barrel length can also be adjusted (longer) if desired. 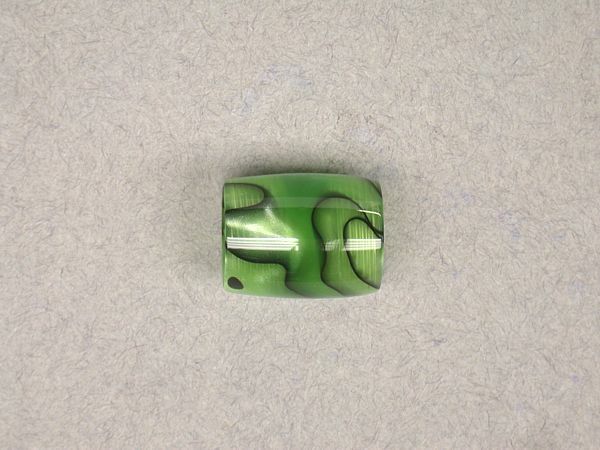 As stated earlier, the PFP can be special ordered in your choice of material, color or pattern. The pens shown here are examples of previously ordered pens, but most of the colors can also be reordered. 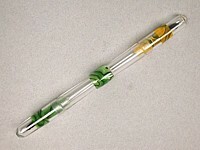 As you can see from the examples below, the pen can also be modified in a variety of ways, allowing you to create your own unique one of a kind pen. Many of the alternate styles shown were custom orders from previous clients. So if you have a favorite style, color or pattern you would like, please contact me to discuss your preferences. The PFP is also available in a Flat-top version with a sturdy CLIP that makes it handy for securing in a hip pocket, purse, computer bag, or knapsack. A few samples of the clip version is also shown below. 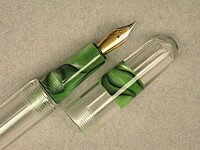 Please note that the standard round-end style can not be ordered with a clip. The PFP was originally made specifically as an Eyedropper. It includes a special rubber o-ring on the section that seals the ink inside the barrel. The o-ring eliminates the need for using silicone on the threads in order to seal the barrel. 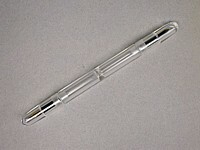 However the pen is also made to accept a standard (short) disposable cartridge or a mini-squeeze converter. Each pen comes ready to use in any of the three inking options. It comes with a pair of disposable cartridges (one blue and one black), a mini squeeze converter, and several spare o-rings. I also offer a variety of hand-made Pen Props and Pen Buttons. You can order a Pen Prop in a material to match your pen, or any one of the wooden styles made in a variety of stained or dyed colors. The Pen Buttons are available for any of the clipless pens. 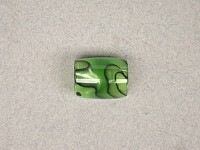 Other new items available are cuff-links and button covers. Both can be ordered with acrylic centers that match your custom pen. 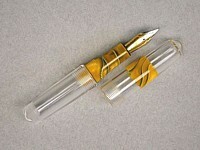 The CLEAR acrylic used for this pen is a CAST acrylic. 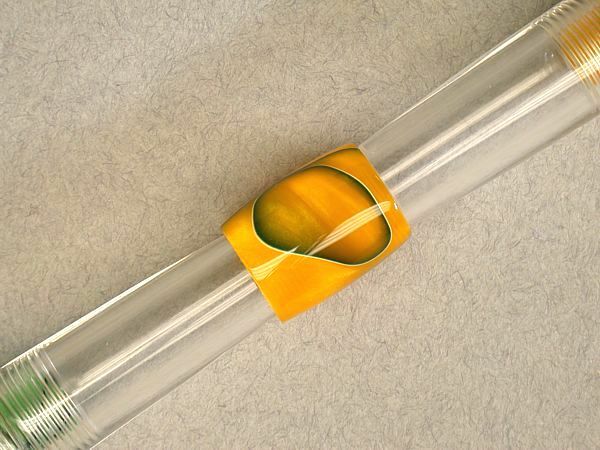 While it's hard to find, you can at times purchase standard clear acrylic pen blanks, but the material I use was purchased from an acrylic supplier in one meter long (round) rods. The advantage is that it's cheaper, and more importantly, readily available, whereas the clear acrylic pen blanks are not. When I first ordered the rods (for a prior project), I ordered EXTRUDED acrylic because it was much cheaper. But as soon as I started turning it, I knew I made a mistake. It was very hard and heated very quickly, actually melting instead of coming away as shavings. But the worst part was the next day after I turned the parts I found all were entirely "crazed". It was actually very cool looking, but since it was actual cracks, it made the parts very weak and they would break easily when stressed. So I reordered the more expensive CAST rods and have been very happy with them. While they're still harder than other acrylics and will still heat up quickly, it's managable. And more importantly, the material is stable. No crazing or cradking. This was a very cool project to work on! My client uses four different colors of inks and wanted to be able to quickly switch from one color to another. 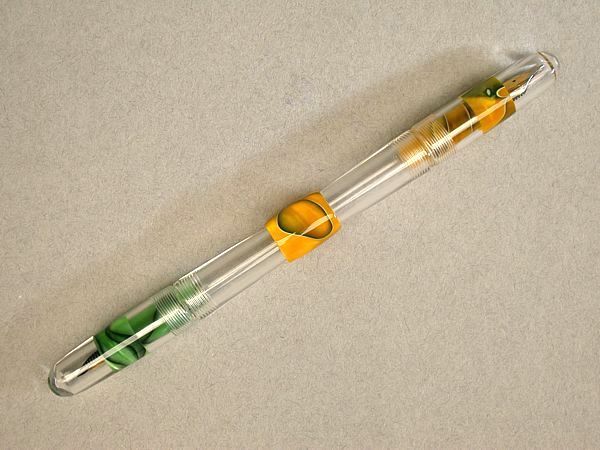 The original idea was to make him a set of standard size PFP's, then make a coupler so two pens could be connected (which we did make), but for two of the colors he decided he wanted a single one piece double-ended pen. He also asked for an extended barrel, so instead of just doubling the barrel length, I also added an additional inch to the barrel length. Despite the seemingly very long length, the pen was actually very comfortable to use. I was able to quickly flip the pen end over end to use the other color. So I think the pen will fit the customers needs very well. I also made a pair of single pens that join together with the original coupler idea. 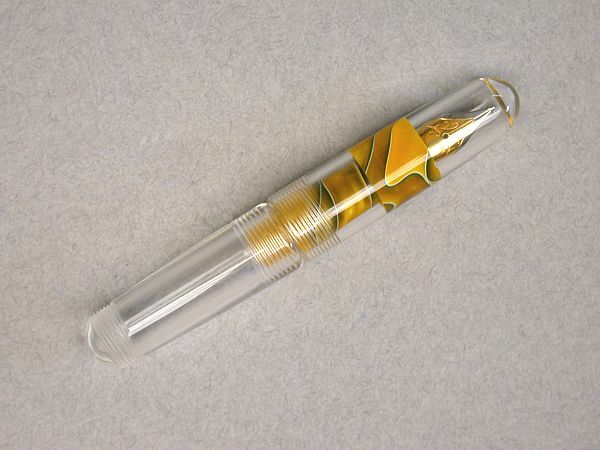 With those two pens, he wanted a little extra flair added to the clear acrylic, so we used a colored front section along with a band on the cap to differentiate the two colors (Kryptonite for green, Yellow Jacket for black). Those pens are posted separately. 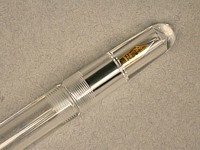 Another unique features on this pen was the "coupler's" used to couple TWO pens together into one. As with all the PFP's, the end of the barrels are threaded in order to securely post the cap so the pen is long enough to hold for comfortable writing. 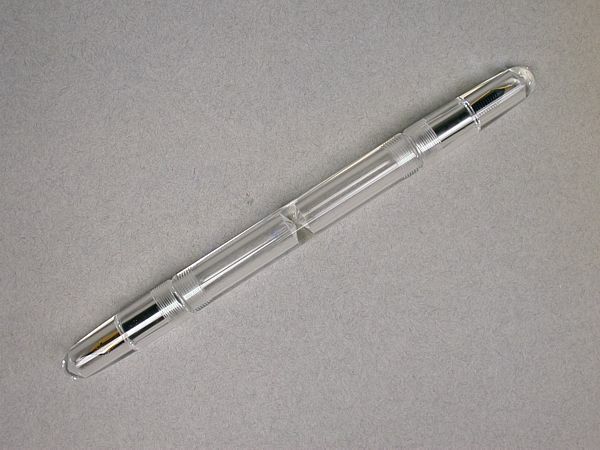 But on these PFP's the posting threads were also used to secure a "coupler" used to couple TWO standard size pens together to create one long double-ended pen similar to the one-piece double ended pen. 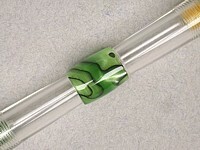 Color / Material: Clear Cast Acrylic Rod. 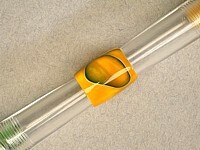 Length: Capped = 8.125" / Uncapped = 7.125" / Posted: 5.70". 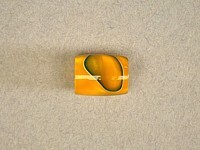 Diameter: - Center = .62" / Barrel end = .50" / Cap end = .50". 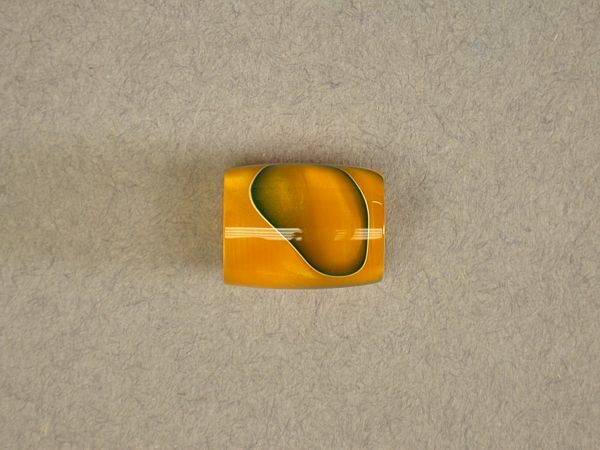 Weight (capped w/o ink): 30.5 gms. Nib:- 2-tone Steel #5 Meister. Filling System: Cartridge / Eyedropper.